Like viruses, intracellular bacteria stimulate their host cells to produce type I IFNs (IFN-α and IFN-β). In our study, we investigated the signals and molecules relevant for the synthesis of and response to IFN by mouse macrophages infected with Listeria monocytogenes. We report that IFN-β is the critical immediate-early IFN made during infection, because the synthesis of all other type I IFN, expression of a subset of infection-induced genes, and the biological response to type I IFN was lost upon IFN-β deficiency. The induction of IFN-β mRNA and the IFN-β-dependent sensitization of macrophages to bacteria-induced death, in turn, was absolutely dependent upon the presence of the transcription factor IFN regulatory factor 3 (IRF3). IFN-β synthesis and signal transduction occurred in macrophages deficient for TLR or their adaptors MyD88, TRIF, or TRAM. 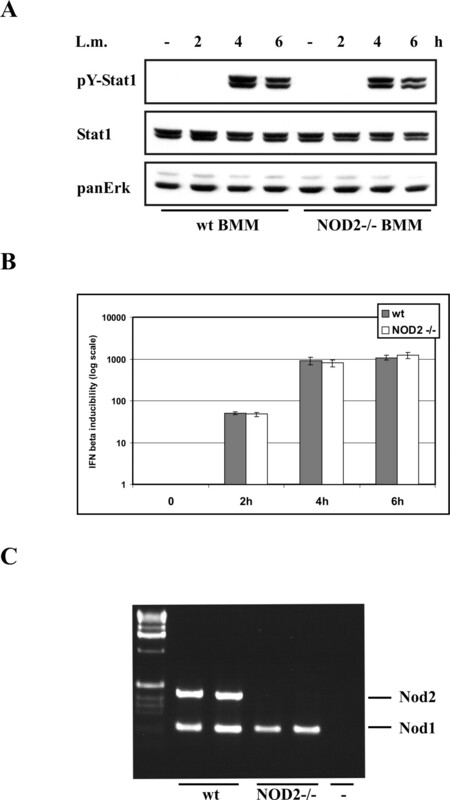 Expression of Nod2, a candidate receptor for intracellular bacteria, increased during infection, but the protein was not required for Listeria-induced signal transduction to the Ifn-β gene. Based on our data, we propose that IRF3 is a convergence point for signals derived from structurally unrelated intracellular pathogens, and that L. monocytogenes stimulates a novel TLR- and Nod2-independent pathway to target IRF3 and the type I IFN genes. A large number of pathogenic microbes enter cells of the host organism to evade extracellular effector mechanisms of the immune system and to use the host cell machinery for their own propagation. To ensure clearance of such microbes, intracellular effector mechanisms must be set in action. A prominent pair of intracellular pathogen and antimicrobial effector mechanism are viruses and the antiviral state caused by type I IFNs (IFN-αβ). In virus-infected cells, IFN regulatory factor 3 (IRF3)4 is rapidly activated, and is a transcription factor critically involved in the formation of an enhanceosome on the promoter of the Ifn-β gene (1, 2). The synthesis of IFN-β stimulates signaling through the type I IFNR and causes the formation of the transcription factor IFN-stimulated gene factor-3, a trimeric complex with Stat1, Stat2, and IRF9 subunits. IFN-stimulated gene factor-3 initiates transcription of the irf7 gene. IRF7 subsequently stimulates transcription of many IFN-α subtypes, thus a second and delayed wave of type I IFN synthesis (3). Much effort has been devoted recently to the identification of sensor proteins of viral infection. It has become clear that viral sensor proteins exist in the host cell cytoplasm (4, 5). However, viruses and virus-associated molecular patterns can also stimulate signaling from the plasma membrane or from within endocytic compartments. Four members of the TLR family, TLR3, -7, -8, and -9, have been shown to signal in response to different viral molecules, and these signals target the IFN-β gene (6, 7, 8, 9, 10, 11). In this study, we examine macrophages infected with Listeria monocytogenes to address the question whether activation of the IRF3 pathway and subsequent waves of type I IFN production are general responses to intracellular pathogens and whether all intracellular pathogens achieve this goal at least in part via TLRs. We also examine a possible involvement of nucleotide-binding oligomerization domain 2 (Nod2), a cytoplasmic protein shown to bind bacterial peptidoglycan and capable of initiating signal transduction through its caspase recruitment domain (CARD) (12, 13). The Gram-positive bacterium L. monocytogenes is endowed with a cluster of virulence genes that allow intracellular survival and multiplication as well as spreading between cells (14, 15). Following internalization or phagocytic uptake, L. monocytogenes escapes from internal vacuolar compartments to the cytoplasm. Cytoplasmic escape requires the lytic activity of listeriolysin O (LLO), the major virulence factor encoded in the L. monocytogenes virulence gene cluster. IFN-γ-activated macrophages efficiently kill ingested Listeria, whereas resting macrophages provide a suitable cytoplasmic environment for bacterial multiplication (16). Infection with L. monocytogenes ultimately kills resting-state macrophage hosts through signals and intracellular effector mechanisms that are largely unknown (17, 18). In the early phase of infection, L. monocytogenes induces macrophages to synthesize IFN-β and to initiate Jak-Stat signaling through the type I IFNR. Genetic disruption of the type I IFNR subunits, or of Stat1, results in an increased resistance of macrophages to Listeria-induced death, implicating type I IFN in bacteria-mediated killing of their cellular host (18). Strikingly, LLO-mutant bacteria, which are nonpathogenic and do not kill macrophages, do not stimulate IFN-β synthesis (18, 19). This finding can either be explained with a role of LLO in signal transduction, as has recently been shown for the production of IL-12 and IFN-γ, the stimulation of Ca2+ signaling, lipid mediator release, or an apoptotic response (20, 21, 22, 23, 24), or it may reflect the role of LLO in phagosome escape, which would allow recognition by cytoplasmic receptors (18, 19). Like probably all bacterial pathogens, L. monocytogenes stimulates signal transduction from members of the TLR family (25, 26, 27, 28). Whether these receptors contribute to the onset of Ifn-β transcription, or whether the gene is targeted by signals from intracellular receptors like Nod2 is not known. The results we present clearly show that like viruses L. monocytogenes stimulate type I IFN production, with the expression of IFN-α subtypes essentially depending on early IFN-β production. All type I IFN synthesis requires signals through the IRF3 pathway. However, we find no evidence that these events require TLRs or the adaptors that connect them to the IRF3 pathway. Additionally, our data rule out a role for Nod2 in converting the presence of intracellular L. monocytogenes into signals targeting the Ifn-β gene. Recombinant murine IFN-β was purchased from Calbiochem (La Jolla, CA) and used at a concentration of 500 U/ml, if not indicated otherwise. LPS from Salmonella minnesota was obtained from Alexis (Vienna, Austria) and used at a concentration of 1 μg/ml. Poly(I:C) was purchased from Sigma-Aldrich (Vienna, Austria) and used at a concentration of 50 μg/ml. Polyclonal rabbit antiserum to Ser727-phosphorylated Stat1 has recently been described (29). Rabbit antiserum to Y701-phosphorylated Stat1 was purchased from New England Biolabs (Beverly, MA) and used at a dilution of 1/1000. A mAb recognizing the Stat1 N terminus was purchased from BD Transduction Laboratories (Lexington, KY). Phosphospecific Abs against p38 MAPK and rabbit antiserum to p38 MAPK were bought from New England Biolabs and used at dilutions of 1/1000. mAbs recognizing ERKs (panERK) were purchased from BD Transduction Laboratories and used at a dilution of 1/2000 in Western blots. Mice deficient for IFN-β (30), IRF3 (2), Stat1 (31), TLR4 (32), TLR9 (33), MyD88 (34), Toll/IL-1R (TIR) domain-containing adaptor inducing IFN-β (TRIF) (35), TRIF-related adaptor molecule (TRAM) (36), or Nod2 (37) were housed under specific pathogen-free conditions. With the exceptions mentioned below, all mutant mice were in a C57BL/6 genetic background (at least eight backcrosses). TRIF- and TRAM-deficient mice were used after two backcrosses to C57BL/6 with genetically matched wild-type (wt) controls. Nod2-deficient mice were in a C57BL/6 × BALB/c mixed background and used in experiments with appropriate wt littermates. Bone marrow-derived macrophages were obtained by culture of bone marrow in L cell-derived CSF-1 as described (38). Raw 264.7 cells were cultured in DMEM supplemented with 10% FCS. L. monocytogenes wt (39), or the isogenic, nonhemolytic mutant, which lacks the hly (LLO) gene, were cultured in brain heart infusion broth. A protocol for this procedure has been described recently (29). Abs were used as indicated above or in the figures. Total RNA was extracted from macrophages using the NucleoSpin RNA II kit (Macherey-Nagel, Düren, Germany). The cDNAs used in the real-time PCR assays were reverse transcribed from 5 μg of total RNA using the Oligo(dT)12–18 Primer and the RevertAid M-MuLV Reverse Transcriptase (MBI Fermentas, St. Leon-Rot, Germany) for first-strand cDNA synthesis according to the manufacturer’s recommendations. Real-time PCR experiments were run on the iCycler IQ (Bio-Rad, Hercules, CA) to amplify the GAPDH housekeeping gene, chosen as an endogenous control for normalization of the cDNA load and the desired gene as described (40), using SybrGreen (Molecular Probes, Eugene, OR). Real-time PCR assays targeting GAPDH, IFN-β, NOD1, NOD2, inducible NO synthase (iNOS), IRF7, or guanylate-binding protein (GBP) were performed with the following forward (f) and reverse (r) primers: GAPDH-f, 5′-TGCACCACCAACTGCTTAGC-3′; GAPDH-r, 5′-GGCATGGACTGTGGTCATGAG-3′; IFN-β-f, 5′-TCAGAATGAGTGGTGGTTGC-3′; IFN-β-r, 5′-GACCTTTCAAATGCAGTAGATTCA-3′; NOD1-f, 5′-TCTCAGTCTTGCATTCAATGGC-3′; NOD1-r, 5′-TGTCAGTGTGGTGTTCTGCTT-3′; NOD2-f, 5′-TGCCTTCCTTCTACAGCACG-3′; NOD2-r, 5′-TGACACTCAGCAGCCTCGTA-3′; iNOS-f, 5′-GCTTGCCCCAACAGGAGAAG-3′; iNOS-r, 5′-GCTGCCCGGAAGGTTTGTAC-3′; IRF7-f, 5′-CTGGAGCCATGGGTATGCA-3′; IRF7-r, 5′-AAGCACAAGCCGAGACTGCT-3′; GBP2-f, 5′-TGCTAAACTTCGGGAACAGG-3′; GBP2-r, 5′-GAGCTTGGCAGAGAGGTTTG-3′. For quantitative analyses of gene expression, normalized to an endogenous control, we used the standard curve method, which was detailed previously (41). Where possible, primers were designed to flank introns to rule out contamination with genomic DNA. In the case of type I IFN genes that do not contain introns, the presence of genomic DNA was routinely tested in samples not subjected to reverse transcription. Expression analysis of IFN-α subtypes (IFN-αn) by conventional RT-PCR was conducted with a primer set annealing simultaneously to several subtype sequences (42): IFN-αn-f, 5′-TCTGATGCAGCAGGTGGG-3′; IFN-αn-r, 5′-AGGGCTCTCCAGAYTTCTGCTCTG-3′. Macrophages were infected with L. monocytogenes (derived from overnight culture) at different multiplicities of infection and incubated for 1 h at 37°C in a humidified 5% CO2 atmosphere. Extracellular bacteria were subsequently killed with gentamicin-containing medium (final concentration, 50 μg/ml). After another 60 min, the medium was changed to medium containing 10 μg/ml gentamicin. Where indicated, IFN-β was added. Then, the assay was incubated for 24–48 h. For crystal violet staining, the medium was removed, and the cells were washed with PBS. Fifty microliters of 1% crystal violet in 20% methanol were added and incubated for 20 min. Finally, the cells were washed several times with PBS or water to get rid of excess crystal violet. Our first aim was to determine whether L. monocytogenes causes the production of IFN-α subtypes (IFN-αn) and whether IFN-αn production was both subsequent to and dependent on the synthesis of IFN-β. Infected macrophages from IFN-β-deficient mice failed to produce type I IFN activity, as evident from the lack of Stat1 tyrosine phosphorylation (Fig. 1⇓A). In L. monocytogenes-infected macrophages, Stat1 tyrosine phosphorylation is a readout specifically for type I IFNR signaling, because IFN-γ, which also activates Stat1, is not produced (data not shown). The complete lack of Stat1 tyrosine phosphorylation indicated either that IFN-β was the only type I IFN produced upon infection, or that the synthesis of other type I IFNs required IFN-β activity. Fig. 1⇓B shows that the latter assumption is correct. Despite similar kinetics of induction for IFN-αn and IFN-β, infected macrophages produced IFN-α subtypes in complete dependence on the presence of both IFN-β and Stat1. Signal transduction and IFN-αn synthesis in IFN-β-deficient macrophages exposed to L. monocytogenes. A, Bone marrow-derived macrophages were infected with L. monocytogenes at MOI of 10 for the indicated periods. Thereafter, Stat1 tyrosine phosphorylation, serine phosphorylation, and p38MAPK activation were detected in Western blots with phosphospecific Abs. Differences in Stat1 expression levels between wt macrophages and macrophages deficient for IFN-β were analyzed by reprobing the blot with a mAb to the Stat1 N terminus. As a normalization control, the blot was finally probed with Abs to the Erk1 and Erk2 kinases (panErk) and to p38MAPK. B, IFN-αn mRNA expression was detected by RT-PCR using primers annealing to sequences found in the genes of several IFN-α subtypes (see Materials and Methods). IFN-β-deficient macrophages expressed less Stat1 than their wt counterparts (Fig. 1⇑A). Moreover, the amount of Stat1 phosphorylated at serine-727 upon infection with L. monocytogenes, a prerequisite for maximal transcriptional activity (43), was strongly reduced in IFN-β-deficient macrophages (Fig. 1⇑A). During infection of macrophages, Stat1 serine phosphorylation is caused by signals from the type I IFNR as well as by L. monocytogenes-dependent activation of the p38MAPK pathway (44, 45). Therefore, the decrease in serine-727-phosphorylated Stat1 most likely resulted from reduced expression as well as the absence of type I IFN signaling, whereas the p38MAPK pathway, unaffected by IFN-β deficiency (Fig. 1⇑A), caused the residual phosphorylation seen in the absence of IFN-β. As in the case of IFN-β deficiency, infected macrophages from IRF3-deficient mice were unable to stimulate Stat1 tyrosine phosphorylation (Fig. 2⇓A). This resulted from an almost complete absence of both IFN-β and IFN-αn mRNA expression (Fig. 2⇓, B and C). Consistent with mRNA expression, the appearance of bioactive IFN in the supernatants of infected cells was suppressed below the level of detection in IRF3-deficient cells. This was measured by the ability of the supernatants to cause Stat1 tyrosine phosphorylation when added to untreated indicator macrophages (Fig. 2⇓D, upper panel). 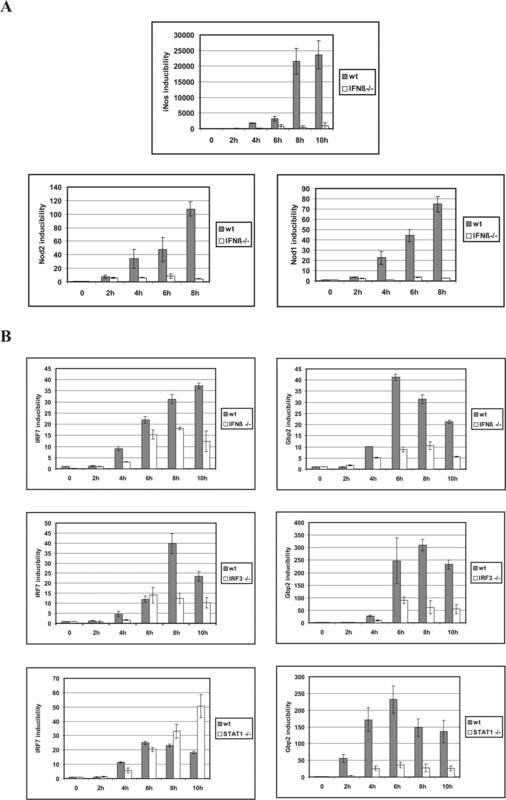 Comparison with defined amounts of recombinant cytokine allowed the determination of the concentration of type I IFN secreted by infected wt macrophages within 4 h at ∼100 U/ml (Fig. 2⇓D, lower panel; compare the signal in the last lane with the signals produced by rIFN-β). Similar to IFN-β-deficient macrophages, those lacking IRF3 showed reduced expression of Stat1 (Fig. 2⇓A). In further similarity to IFN-β-deficient cells, Stat1 phosphorylated at serine-727 was less abundant, and p38MAPK activation was unaffected (Fig. 2⇓A). Signal transduction and IFN-β synthesis in IRF3-deficient macrophages exposed to L. monocytogenes. A, Bone marrow-derived macrophages were infected with L. monocytogenes at MOI of 10 for the indicated periods. Thereafter, Stat1 tyrosine phosphorylation, serine phosphorylation, and p38MAPK activation were detected in Western blots with phosphospecific Abs. Differences in Stat1 expression levels between wt macrophages and macrophages deficient for IRF3 were analyzed by reprobing the blot with a mAb to the Stat1 N terminus. As a normalization control, the blot was finally probed with Abs to the Erk1 and Erk2 kinases (panErk) and to p38MAPK. B, wt bone marrow-derived macrophages or macrophages deficient for IRF3 were exposed to wt L. monocytogenes at MOI of 10. After the indicated periods, total mRNA was extracted, reverse-transcribed, and analyzed by real-time PCR for IFN-β expression. Values were normalized to those obtained with the GAPDH housekeeping gene. To calculate inducibility, the values obtained from uninfected macrophages were used as a calibrator. C, IFN-αn mRNA expression was detected by RT-PCR using primers annealing to sequences found in the genes of several IFN-α subtypes (see Materials and Methods). D, Upper panel, A comparison of type I IFN activity secreted by wt or IRF3-deficient macrophages, left untreated or after infection with L. monocytogenes for 4 h, was made by transferring the indicated dilutions of cell supernatants to untreated macrophages for 30 min and analyzing their ability to cause phosphorylation of Stat1. The amount of Stat1 phosphorylated at Y701 was visualized by Western blotting as described above. Lower panel, The Stat1 tyrosine phosphorylation dependence on IFN-β concentration was determined by Western blotting after treatment of macrophages with the indicated IFN-β doses for 30 min. In the last three lanes, the Stat1 tyrosine phosphorylation signals produced by untreated macrophages (−), by macrophages infected for 4 h with L. monocytogenes (L.m.4h), or by macrophages treated for 30 min with a supernatant derived from cells after 4 h of infection with L. monocytogenes (SN L.m. ), are shown for comparison. To confirm the essential character of IRF3 and IFN-β for biological type I IFN activity during infection, we tested the sensitivity of macrophages to L. monocytogenes-induced cell death. As shown previously for IFNR- or Stat1-deficient cells, the absence of type I IFN signaling results in a strongly increased resistance of macrophages to L. monocytogenes-mediated lysis (18). Consistent with this, IFN-β-deficient macrophages were killed only at the highest multiplicities of infection (MOI; Fig. 3⇓), whereas their counterparts from wt mice were killed by infection at low MOI. Exogenous IFN-β, added 2 h postinfection to mimic the synthesis of endogenous cytokine, restored the sensitivity to cell death (Fig. 3⇓B). Importantly, IRF3-deficient macrophages were as resistant to lysis as the IFN-β-deficient cells (Fig. 3⇓, A and B), confirming the essential role of the protein in bacteria-induced type I IFN synthesis. Control macrophages infected with LLO-mutant bacteria remained viable irrespective of their genotype and the MOI (Fig. 3⇓). L. monocytogenes-induced death in IFN-β- or IRF3-deficient macrophages. Bone marrow-derived macrophages in microtiter wells were infected with wt or LLO-mutant L. monocytogenes at the indicated MOI. After allowing uptake of the bacteria for 1 h, extracellular bacteria were killed by treatment with gentamicin. At 36–48 h after infection, surviving cells were stained with crystal violet dye. A, IFN-β- or IRF-3-deficient macrophages were analyzed with wt bacteria or, as controls, with the lysis-defective LLO mutant of L. monocytogenes. B, IFN-β- or IRF-3-deficient macrophages were left untreated or treated with IFN-β 2 h postinfection, and cell death caused by wt L. monocytogenes was determined by crystal violet staining. After stimulation with a variety of pathogen-associated molecular patterns, TLR3, -4, -5, -7, -8, and -9 were shown to stimulate IFN-β transcription (46). Among these, TLR3, -7, and -8 are unlikely to contribute to responses against Listeria, due to their specific ligands, dsRNA or ssRNA, respectively (7, 8, 9). TLR4, -5, and -9 are candidate receptors for L. monocytogenes-associated molecular patterns due to their role in binding multiple, structurally unrelated ligands (TLR4), flagellin (TLR5), or bacterial DNA (TLR9). Flagellin binding to TLR5 leads to the production of small amounts of IFN-β. However, this activity requires heterodimerization with and signal transduction through TLR4 (47). Based on this reasoning, we tested the impact of TLR4 and TLR9 deficiency on L. monocytogenes-induced signaling in macrophages. Neither TLR was essential for the synthesis of type I IFN, as shown by the ability of TLR-deficient macrophages to cause Stat1 tyrosine phosphorylation (Fig. 4⇓, A and B). 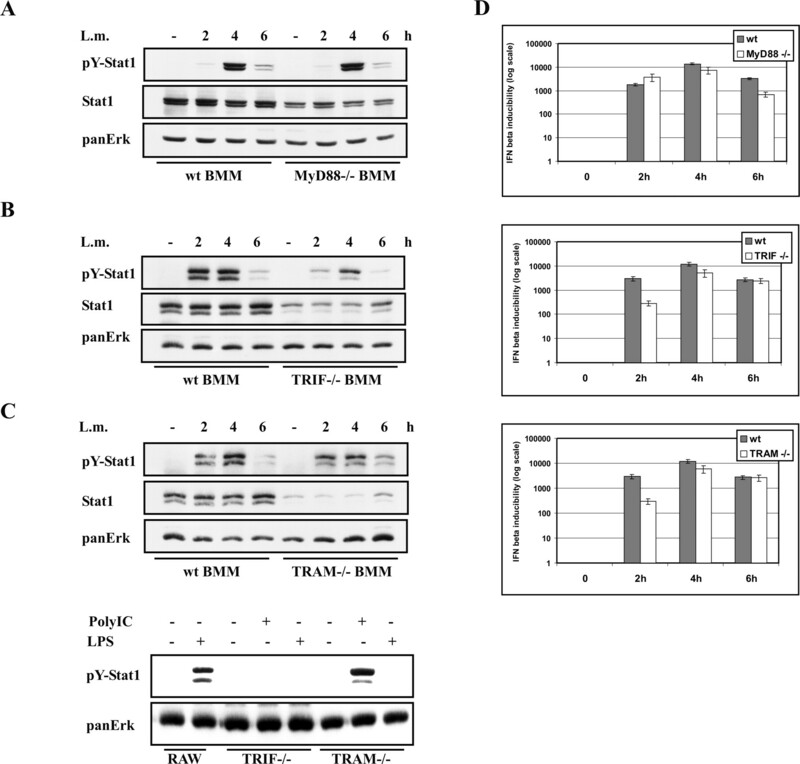 These findings were corroborated by experiments measuring IFN-β mRNA synthesis, which did not significantly differ between cells from wt or TLR-deficient mice (Fig. 4⇓C). Furthermore, the occurrence of bacteria-induced cell death was not influenced by the absence of these TLRs (data not shown), excluding their contribution to the establishment of biological type I IFN activity. L. monocytogenes-induced signal transduction in the absence of TLRs. A and B, wt bone marrow-derived macrophages and macrophages deficient in TLR4 or TLR9 were infected with L. monocytogenes wt for the indicated periods. 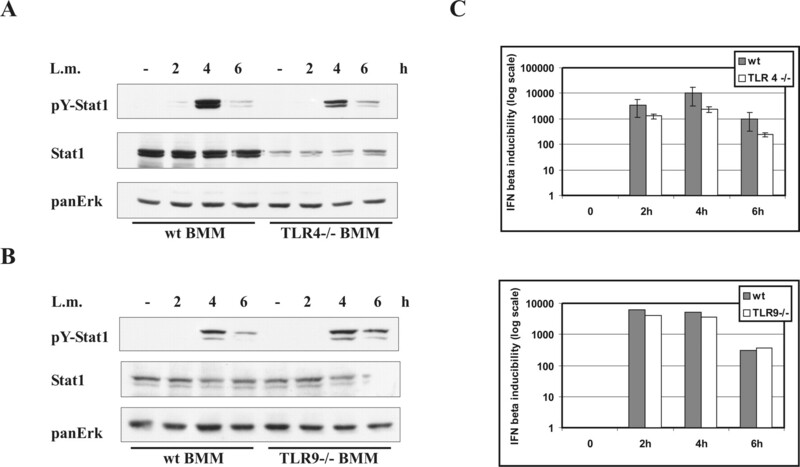 Stat1 tyrosine phosphorylation in macrophages deficient for TLR4 or TLR9 was detected in Western blots with phosphospecific Abs. Differences in Stat1 expression levels between wt macrophages and TLR-deficient macrophages were analyzed by reprobing the blot with a mAb to the Stat1 N terminus. As a normalization control, the blot was finally probed with Abs to the Erk1 and Erk2 kinases (panErk). C, Total mRNA was extracted, reverse-transcribed, and analyzed by quantitative real-time PCR for IFN-β expression. Values were normalized to those obtained with the GAPDH housekeeping gene. To calculate inducibility, the values obtained from uninfected macrophages were used as a calibrator. Whereas Stat1 activation after L. monocytogenes infection did not require TLR activity, TLR4-deficient resting macrophages expressed reduced levels of Stat1 (Fig. 4⇑A), suggesting that this receptor provides a maintenance signal for Stat1 expression in the absence of ligand. To confirm that signals to the Ifn-β gene do not originate from TLRs during L. monocytogenes infection, we examined whether absence of the adaptor proteins connecting TLRs to the IRF3 pathway abrogated the ability of infected macrophages to produce type I IFN. IRF3 activation and IFN-β synthesis in response to signals from TLRs results from the selective recruitment of adaptor molecules to their intracellular TIR domains (48, 49). The general adaptor MyD88 is involved in stimulating IFN-β synthesis in the context of TLR9 signaling (50, 51, 52). TRIF/TIR-containing adaptor molecule-1 (TICAM-1) endows both TLR3 and TLR4 with the ability to activate IRF3 independently of MyD88 (35, 53, 54, 55, 56). In the context of TLR4, but not TLR3, the ability of TRIF to signal to IRF3 requires TRAM, a further adaptor protein (36, 55). Macrophages deficient for either MyD88, TRIF, or TRAM were tested for their ability to synthesize IFN-β mRNA and to activate Stat1 during infection with L. monocytogenes. None of the adaptor proteins was critically involved in stimulating the synthesis of IFN-β (Fig. 5⇓D). The absence of TRIF or TRAM caused some delay in the induction of IFN-β mRNA, but maximal levels after 4 h were as high as those found in cells from wt animals. The absence of TRIF or TRAM was accompanied by a reduced level of Stat1 expression compared with wt macrophages (Fig. 5⇓, A–C). Consistent with this, somewhat lower levels of tyrosine-phosphorylated Stat1 were observed in absence of the adaptor proteins TRIF and TRAM (Fig. 5⇓, B and C). Control experiments showed the expected defects in poly(I:C) and/or LPS signaling caused by TRAM or TRIF deficiency (Fig. 5⇓C, lower panel). MyD88 deficiency caused profound effects on MAPK activation by L. monocytogenes (data not shown), confirming the reported involvement of MyD88 in responses to the bacterium and the previous distinction between MyD88-dependent and -independent signal transduction by bacterial products. As in the case of TLR deficiency, cell death induced by L. monocytogenes was not different between macrophages from wt and MyD88-, TRIF-, or TRAM-deficient animals (data not shown). This further confirms that IFN-β synthesis does not critically require TLR adaptor proteins. L. monocytogenes-induced signal transduction and IFN-β synthesis in the absence of the TLR adaptor proteins MyD88, TRIF, or TRAM. wt bone marrow-derived macrophages and macrophages deficient in the indicated TLR adaptors were infected with wt L. monocytogenes at MOI of 10 for the indicated periods. Stat1 tyrosine phosphorylation in macrophages deficient for MyD88 (A), TRIF (B), or TRAM (C) was detected in Western blots with phosphospecific Abs. Differences in Stat1 expression levels between wt macrophages and adaptor protein-deficient macrophages were analyzed by reprobing the blot with a mAb to the Stat1 N terminus. As a normalization control, the blot was finally probed with Abs to the Erk1 and Erk2 kinases (panErk). The lower panel of C shows Stat1 tyrosine phosphorylation in LPS-stimulated, Raw 264.7 macrophages, or in TRIF- or TRAM-deficient bone marrow-derived macrophages after stimulation of TLR4 with LPS, or stimulation of TLR3 with dsRNA. A loading control was performed by reprobing the blot with panErk Abs. D, Total mRNA was extracted, reverse-transcribed, and analyzed by quantitative real-time PCR for IFN-β expression. Values were normalized to those obtained with the GAPDH housekeeping gene. To calculate inducibility, the values obtained from uninfected macrophages were used as a calibrator. The Nod1 and Nod2 proteins are thought to act as intracellular receptors of bacterial cell walls (57). Nod1 binds bacterial murodipeptides containing meso-diaminopimelic acid derived mainly from Gram-negative bacteria. Consistently, Nod1-deficient macrophages or epithelial cells show impaired responses to murodipeptides containing meso-diaminopimelic acid, but normal responses to muramyl dipeptide (MDP) (58, 59). Nod1 did not activate NF-κB upon introduction of extracts derived from L. monocytogenes into the cytoplasm, suggesting it is not involved in sensing intracellular infection with this pathogen (59). Nod2 was shown to bind MDP derived from peptidoglycan of both Gram-positive and Gram-negative bacteria, and Nod2-deficient macrophages show blunted responses to MDP (37, 60). Girardin and colleagues (12, 59) proposed Nod2 as a more general sensor of intracellular bacteria. We used Nod2-deficient macrophages to examine whether the protein might be an essential receptor for intracellular L. monocytogenes. As shown in Fig. 6⇓A, amounts of Stat1 and Stat1 tyrosine phosphorylation were identical in infected macrophages from Nod2-deficient or wt mice. In accordance with this, expression of the Ifn-β gene in infected cells was highly similar in the presence or absence of Nod2 (Fig. 6⇓B). The death of infected macrophages also showed a very similar dependence on the MOI (data not shown), ruling out a crucial role of Nod2 in stimulating signals targeting the cell death machinery. The control RT-PCR shown in Fig. 6⇓C confirmed the correct genotype of the cells. Signal transduction and IFN-β synthesis in Nod2-deficient macrophages exposed to L. monocytogenes. A, Bone marrow-derived macrophages were infected with L. monocytogenes at MOI of 10 for the indicated periods. Thereafter, Stat1 tyrosine phosphorylation was detected in Western blots with phosphospecific Abs. Differences in Stat1 expression levels between wt macrophages and macrophages deficient for Nod2 were analyzed by reprobing the blot with a mAb to the Stat1 N terminus. As a normalization control, the blot was finally probed with Abs to the Erk1 and Erk2 kinases (panErk). B, wt bone marrow-derived macrophages or macrophages deficient for Nod2 were exposed to wt L. monocytogenes at MOI of 10. After the indicated periods, total mRNA was extracted, reverse-transcribed, and analyzed by real-time PCR for IFN-β expression. Values were normalized to those obtained with the GAPDH housekeeping gene. To calculate inducibility, the values obtained from uninfected macrophages were used as a calibrator. C, To ascertain the correct genotype of the macrophages used for Fig. 6⇓, A and B, the expression of Nod2 mRNA was analyzed by RT-PCR in wt and Nod2−/− macrophages as described (37 ). Nod1 amounts in the same samples are shown for calibration. The last lane shows a control reaction without cDNA. IFN-stimulated genes (ISGs) contribute significantly to the pattern of genes expressed in response to microbial infection, a finding explained in part by the link of TLR3 and TLR4 to the IRF3 pathway (42, 61, 62). ISG expression was augmented during infection with L. monocytogenes (Fig. 7⇓). Among ISGs, we identified the genes encoding Nod1 and Nod2 proteins and the gene encoding iNOS (NOS2). 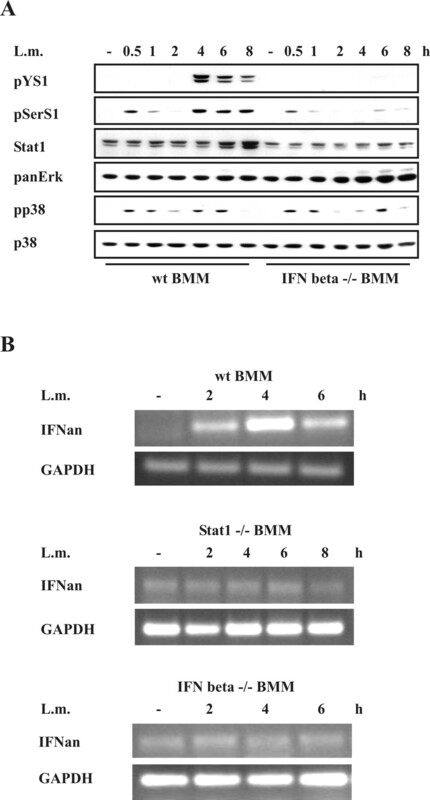 These genes were not expressed upon L. monocytogenes infection of macrophages deficient for IFN-β, suggesting an essential role of JAK-STAT signaling through the type I IFNR for the activation of their promoters (Fig. 7⇓A). Further examples of ISGs stimulated by infection were the gene encoding transcription factor IRF7, whose induction is consistent with the stimulation of Ifn-αn genes shown in Fig. 1⇑, and the gene encoding GBP2. The Irf7 and Gbp2 genes were induced also in absence of IFN-β, albeit at a reduced level (Fig. 7⇓B). Because a subset of ISGs were shown to respond to IRF3 independently of signals from the type I IFNR (63, 64), we tested the ability of IRF3-deficient macrophages to induce the Irf7 and Gbp genes. Both were reduced with respect to wt, but clearly inducible in absence of IRF3 (Fig. 7⇓B). Similarly, the absence of Stat1 reduced, but did not abolish Irf7 and Gbp2 induction. Expression of IFN-inducible genes in macrophages infected with L. monocytogenes. 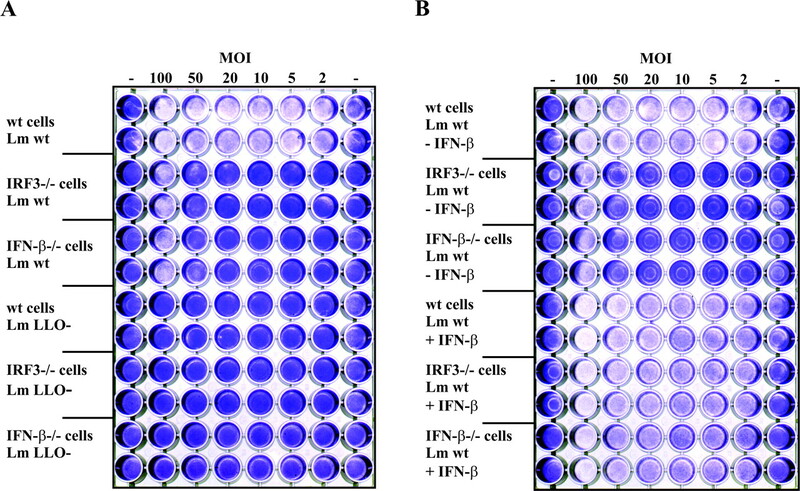 A, wt bone marrow-derived macrophages or macrophages deficient for IFN-β were infected with L. monocytogenes at MOI of 10 and analyzed for expression of the Nod1, Nod2, and Inos genes by quantitative real-time PCR. Values were normalized to those obtained with the GAPDH housekeeping gene. To calculate inducibility, the values obtained from uninfected macrophages were used as a calibrator. B, wt bone marrow-derived macrophages or macrophages deficient for either IFN-β, IRF3, or Stat1 were infected with wt L. monocytogenes at MOI of 10. After the indicated periods, expression of the Irf7 and Gbp2 genes was analyzed by quantitative real-time PCR as described for A. Our results emphasize the activation of the IRF3 pathway as a common denominator of responses to at least some intracellular pathogens. Although there is little structural or biological resemblance between viruses and intracellular bacteria, both share the ability to activate IRF3 kinases and use the transcription factor for type I IFN synthesis and a subsequent cellular IFN response. The benefit of this pathway for the host organism is obvious in the case of viruses through the induction of an antiviral state. It is much less clear for intracellular bacteria. In fact, type I IFNR- or IRF3-deficient mice appear to have an increased ability to clear bacteria from infected organs, which results from a reduced sensitivity to L. monocytogenes-induced host cell death (65, 66, 67, 68). IFN-β-deficient mice might similarly be expected to have increased resistance to infection with L. monocytogenes. Our results further suggest that TLRs and the adaptor proteins linking them to the Ifn-β gene are not involved in transducing L. monocytogenes-derived signals. The slight reduction in IFN-β mRNA expression observed in TRIF-deficient cells is in sharp contrast to the complete lack of IFN-β synthesis and Stat1 tyrosine phosphorylation caused by TRIF deficiency after TLR3 stimulation and by TRIF or TRAM deficiency after TLR4 stimulation (35, 36). Besides supporting the notion that IFN-β production and IFN-β-mediated death sensitization are TLR-independent events, our analyses of infected macrophages show that the mechanism of death induction by L. monocytogenes differs from that used by Yersinia enterolytica, Bacillus anthracis, or the sipB mutant of Salmonella typhimurium, which in all cases requires signaling through TLR4 (69, 70). TLR-independent type I IFN synthesis supports the hypothesis that the LLO requirement reported for IFN-β or chemokine production (18, 19, 71) reflects a need for intracellular, cytoplasmic recognition of L. monocytogenes rather than a direct signal transduction function of the hemolysin. Consistent with this assumption, partially purified LLO preparations when added to the culture medium of macrophages eventually caused cellular lysis, but failed to induce rapid IFN-β synthesis (18). The Nod family of cytoplasmic proteins containing a leucin-rich repeat domain structurally related to the TLR ectodomain, has received particular attention as cytoplasmic pathogen sensors (57). In this study, we show that Nod2, although recognizing a muropeptide present in Gram-positive and Gram-negative bacteria and recently implicated in signal transduction by internalized Streptococcus pneumoniae (72), is not critically involved in mediating type I IFN synthesis upon infection with L. monocytogenes. This is in line with the lack of IRF3 activation in cells overexpressing the Nod2 CARD domains (5). Together with the data from Girardin and colleagues ruling out a general involvement of Nod1 in cytoplasmic recognition of L. monocytogenes, our results suggest a novel and as-yet-unidentified protein mediating IRF3 activation by cytoplasmic L. monocytogenes. Of note, Yoneyama et al. (5) have recently identified a cytoplasmic receptor, Rig-I, for RNA viruses. Rig-I employs a RNA helicase to bind dsRNA and its CARD domain for signaling to the IRF3 kinases. dsRNA is not a pathogen-associated molecular pattern of cytoplasmic bacteria and therefore, in analogy with TLR3, not a candidate receptor for L. monocytogenes. However, the Rig-I CARD domain may be a paradigm for cytoplasmic pathogen sensors activating the IRF3 pathway. Consistent with our data, this type of CARD domain activates IRF3 without requiring the TLR adaptor TRIF (5). IFN-β synthesis early during infection gives rise to a major contribution of IFN-induced genes (ISGs) to the pattern of Listeria-induced genes. In accordance with studies of Gram-negative bacteria, which induce IFN-β synthesis through TLR4 (42, 61, 62), our findings suggest that the IFN response is a general attribute of phagocytes engaged in antibacterial responses. Interestingly, ISGs expressed upon infection with L. monocytogenes fall into distinct categories. Some, like Nod1/2 or iNOS essentially require IFN-β, whereas others (IRF7, GBP2) can be induced independently of IFN-β/Stat1 signaling, albeit at reduced levels. Direct activation of the respective promoters by IRF3 has been proposed as an alternative mechanism of inducing a subset of ISGs (63, 64). However, our studies show that these genes respond to Listeria infection even in complete absence of IRF3, hence independently of IFN-β synthesis and Stat1 activation (Fig. 2⇑). A possible explanation for this finding could be that resting macrophages express sufficient amounts of IRF7 to mediate ISG induction in absence of IRF3. We have tried to test this hypothesis but failed to obtain clear results due to the inadequacy of Abs from commercial suppliers. An interesting sideline of our results is the finding that, similar to type I IFNR-deficient cells (18), macrophages lacking IFN-β, IRF3, TLR4, or TLR adaptors express reduced levels of Stat1, suggesting a contribution of these proteins to Stat1 maintenance. Because Stat1 is encoded by an IFN-inducible gene, a low constitutive signal through a TLR4-TRIF/TRAM-IRF3-IFN-β pathway may increase its expression due to the secretion of small quantities of type I IFN in the absence of a microbial ligand. As previously hypothesized, the function of this type I IFN/IFNR-dependent autoregulatory loop may be to maintain expression of immune response genes at sufficient levels to provide a state of alertness (73, 74, 75). In analogy to our observations with the TLR4-dependent IRF3-IFN-β pathway, Shi et al. (76) demonstrated a MyD88 requirement for constitutive TNF-α production and NF-κB activation, which synergized with IFN-γ in gene induction. Together, these findings emphasize the potential importance of constitutive receptor signals and autoregulatory cytokine loops in increasing the alertness of the immune system for microbial attack. We thank Manuela Baccarini and Pavel Kovarik for critical discussion and comments on our manuscript. ↵1 This study was supported by the Austrian Science Foundation (Grant P15272 to T.D. ), the Viennese Foundation for Science, Research and Technology (Project LS133 to M.M. and T.D. ), and the Austrian Ministry of Education and Science (Project BM:BWK OEZBT GZ200.074/I-IV/Ia/2002 to M.M.). ↵2 S.S. and B.R. contributed equally to this study. ↵4 Abbreviations used in this paper: IRF, IFN regulatory factor; Nod, nucleotide-binding oligomerization domain; CARD, caspase recruitment domain; LLO, listeriolysin O; TIR, Toll/IL-1R; TRIF, TIR domain-containing adaptor inducing IFN-β; TRAM, TRIF-related adaptor molecule; wt, wild type; iNOS, inducible NO synthase; GBP, guanylate-binding protein; f, forward; r, reverse; MOI, multiplicity of infection; MDP, muramyl dipeptide; ISG, IFN-stimulated gene. Wathelet, M. G., C. H. Lin, B. S. Parekh, L. V. Ronco, P. M. Howley, T. Maniatis. 1998. Virus infection induces the assembly of coordinately activated transcription factors on the IFN-β enhancer in vivo. Mol. Cell 1:507. [Published erratum appears in 1999 Mol. Cell 3:813.]. Levy, D. E., I. Marie, A. Prakash. 2003. Ringing the interferon alarm: differential regulation of gene expression at the interface between innate and adaptive immunity. Curr. Opin. Immunol. 15:52. Yoneyama, M., M. Kikuchi, T. Natsukawa, N. Shinobu, T. Imaizumi, M. Miyagishi, K. Taira, S. Akira, T. Fujita. 2004. The RNA helicase RIG-I has an essential function in double-stranded RNA-induced innate antiviral responses. Nat. Immunol. 5:730. Akira, S., H. Hemmi. 2003. Recognition of pathogen-associated molecular patterns by TLR family. Immunol. Lett. 85:85. Diebold, S. S., T. Kaisho, H. Hemmi, S. Akira, C. Reis e Sousa. 2004. Innate antiviral responses by means of TLR7-mediated recognition of single-stranded RNA. Science 303:1529. Heil, F., H. Hemmi, H. Hochrein, F. Ampenberger, C. Kirschning, S. Akira, G. Lipford, H. Wagner, S. Bauer. 2004. Species-specific recognition of single-stranded RNA via Toll-like receptor 7 and 8. Science 303:1526. Krug, A., G. D. Luker, W. Barchet, D. A. Leib, S. Akira, M. Colonna. 2004. Herpes simplex virus type 1 activates murine natural interferon-producing cells through Toll-like receptor 9. Blood 103:1433. Girardin, S. E., I. G. Boneca, J. Viala, M. Chamaillard, A. Labigne, G. Thomas, D. J. Philpott, P. J. Sansonetti. 2003. Nod2 is a general sensor of peptidoglycan through muramyl dipeptide (MDP) detection. J. Biol. Chem. 278:8869. Ogura, Y., N. Inohara, A. Benito, F. F. Chen, S. Yamaoka, G. Nunez. 2001. Nod2, a Nod1/Apaf-1 family member that is restricted to monocytes and activates NF-κB. J. Biol. Chem. 276:4812. Vazquez-Boland, J. A., M. Kuhn, P. Berche, T. Chakraborty, G. Dominguez-Bernal, W. Goebel, B. Gonzalez-Zorn, J. Wehland, J. Kreft. 2001. Listeria pathogenesis and molecular virulence determinants. Clin. Microbiol. Rev. 14:584. Cossart, P., H. Bierne. 2001. The use of host cell machinery in the pathogenesis of Listeria monocytogenes. Curr. Opin. Immunol. 13:96. Decker, T., S. Stockinger, M. Karaghiosoff, M. Muller, P. Kovarik. 2002. IFNs and STATs in innate immunity to microorganisms. J. Clin. Invest. 109:1271. Barsig, J., S. H. Kaufmann. 1997. The mechanism of cell death in Listeria monocytogenes-infected murine macrophages is distinct from apoptosis. Infect. Immun. 65:4075. Nomura, T., I. Kawamura, K. Tsuchiya, C. Kohda, H. Baba, Y. Ito, T. Kimoto, I. Watanabe, M. Mitsuyama. 2002. Essential role of interleukin-12 (IL-12) and IL-18 for γ interferon production induced by listeriolysin O in mouse spleen cells. Infect. Immun. 70:1049. Sibelius, U., F. Rose, T. Chakraborty, A. Darji, J. Wehland, S. Weiss, W. Seeger, F. Grimminger. 1996. Listeriolysin is a potent inducer of the phosphatidylinositol response and lipid mediator generation in human endothelial cells. Infect. Immun. 64:674. Carrero, J. A., B. Calderon, E. R. Unanue. 2004. Listeriolysin O from Listeria monocytogenes is a lymphocyte apoptogenic molecule. J. Immunol. 172:4866. Torres, D., M. Barrier, F. Bihl, V. J. Quesniaux, I. Maillet, S. Akira, B. Ryffel, F. Erard. 2004. Toll-like receptor 2 is required for optimal control of Listeria monocytogenes infection. Infect. Immun. 72:2131. Kovarik, P., D. Stoiber, M. Novy, T. Decker. 1998. Stat1 combines signals derived from IFN-γ and LPS receptors during macrophage activation. EMBO J. 17:3660. Erlandsson, L., R. Blumenthal, M. L. Eloranta, H. Engel, G. Alm, S. Weiss, T. Leanderson. 1998. Interferon-β is required for interferon-α production in mouse fibroblasts. Curr. Biol. 8:223. Yamamoto, M., S. Sato, H. Hemmi, S. Uematsu, K. Hoshino, T. Kaisho, O. Takeuchi, K. Takeda, S. Akira. 2003. TRAM is specifically involved in the Toll-like receptor 4-mediated MyD88-independent signaling pathway. Nat. Immunol. 4:1144. Pauleau, A. L., P. J. Murray. 2003. Role of nod2 in the response of macrophages to Toll-like receptor agonists. Mol. Cell. Biol. 23:7531. Baccarini, M., F. Bistoni, M. L. Lohmann Matthes. 1985. In vitro natural cell-mediated cytotoxicity against Candida albicans: macrophage precursors as effector cells. J. Immunol. 134:2658. Kocks, C., E. Gouin, M. Tabouret, P. Berche, H. Ohayon, P. Cossart. 1992. L. monocytogenes-induced actin assembly requires the actA gene product, a surface protein. Cell 68:521. Kovarik, P., M. Mangold, K. Ramsauer, H. Heidari, R. Steinborn, A. Zotter, D. E. Levy, M. Muller, T. Decker. 2001. Specificity of signaling by STAT1 depends on SH2 and C-terminal domains that regulate Ser727 phosphorylation, differentially affecting specific target gene expression. EMBO J. 20:91. Heid, C. A., J. Stevens, K. J. Livak, P. M. Williams. 1996. Real time quantitative PCR. Genome Res. 6:986. Sakaguchi, S., H. Negishi, M. Asagiri, C. Nakajima, T. Mizutani, A. Takaoka, K. Honda, T. Taniguchi. 2003. Essential role of IRF-3 in lipopolysaccharide-induced interferon-β gene expression and endotoxin shock. Biochem. Biophys. Res. Commun. 306:860. Varinou, L., K. Ramsauer, M. Karaghiosoff, T. Kolbe, K. Pfeffer, M. Muller, T. Decker. 2003. Phosphorylation of the Stat1 transactivation domain is required for full-fledged IFN-γ-dependent innate immunity. Immunity 19:793. Kovarik, P., D. Stoiber, P. A. Eyers, R. Menghini, A. Neininger, M. Gaestel, P. Cohen, T. Decker. 1999. Stress-induced phosphorylation of STAT1 at Ser727 requires p38 mitogen-activated protein kinase whereas IFN-γ uses a different signaling pathway. Proc. Natl. Acad. Sci. USA 96:13956. Stoiber, D., S. Stockinger, P. Steinlein, J. Kovarik, T. Decker. 2001. 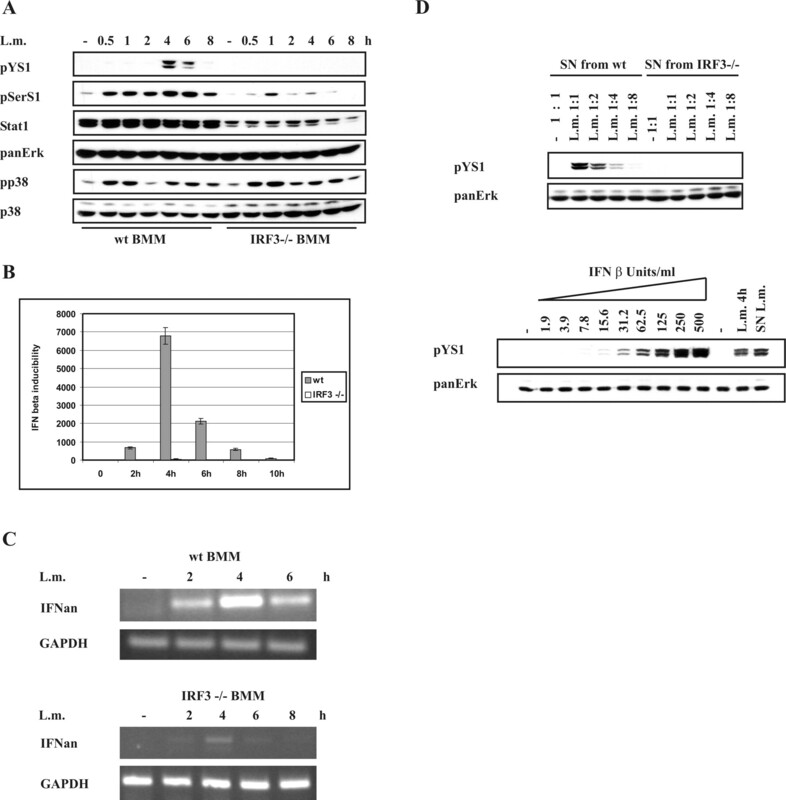 Listeria monocytogenes modulates macrophage cytokine responses through STAT serine phosphorylation and the induction of suppressor of cytokine signaling 3. J. Immunol. 166:466. Mizel, S. B., A. N. Honko, M. A. Moors, P. S. Smith, A. P. West. 2003. Induction of macrophage nitric oxide production by Gram-negative flagellin involves signaling via heteromeric Toll-like receptor 5/Toll-like receptor 4 complexes. J. Immunol. 170:6217. O’Neill, L. A., K. A. Fitzgerald, A. G. Bowie. 2003. The Toll-IL-1 receptor adaptor family grows to five members. Trends Immunol. 24:286. Yamamoto, M., K. Takeda, S. Akira. 2004. TIR domain-containing adaptors define the specificity of TLR signaling. Mol. Immunol. 40:861. Tabeta, K., P. Georgel, E. Janssen, X. Du, K. Hoebe, K. Crozat, S. Mudd, L. Shamel, S. Sovath, J. Goode, et al 2004. Toll-like receptors 9 and 3 as essential components of innate immune defense against mouse cytomegalovirus infection. Proc. Natl. Acad. Sci. USA 101:3516. Sato, S., M. Sugiyama, M. Yamamoto, Y. Watanabe, T. Kawai, K. Takeda, S. Akira. 2003. Toll/IL-1 receptor domain-containing adaptor inducing IFN-β (TRIF) associates with TNF receptor-associated factor 6 and TANK-binding kinase 1, and activates two distinct transcription factors, NF-κB and IFN-regulatory factor-3, in the Toll-like receptor signaling. J. Immunol. 171:4304. Weighardt, H., G. Jusek, J. Mages, R. Lang, K. Hoebe, B. Beutler, B. Holzmann. 2004. Identification of a TLR4- and TRIF-dependent activation program of dendritic cells. Eur. J. Immunol. 34:558. Chamaillard, M., M. Hashimoto, Y. Horie, J. Masumoto, S. Qiu, L. Saab, Y. Ogura, A. Kawasaki, K. Fukase, S. Kusumoto, et al 2003. An essential role for NOD1 in host recognition of bacterial peptidoglycan containing diaminopimelic acid. Nat. Immunol. 4:702. Inohara, N., Y. Ogura, A. Fontalba, O. Gutierrez, F. Pons, J. Crespo, K. Fukase, S. Inamura, S. Kusumoto, M. Hashimoto, et al 2003. Host recognition of bacterial muramyl dipeptide mediated through NOD2: implications for Crohn’s disease. J. Biol. Chem. 278:5509. Peters, K. L., H. L. Smith, G. R. Stark, G. C. Sen. 2002. IRF-3-dependent, NFκB- and JNK-independent activation of the 561 and IFN-β genes in response to double-stranded RNA. Proc. Natl. Acad. Sci. USA 99:6322. Grandvaux, N., M. J. Servant, B. tenOever, G. C. Sen, S. Balachandran, G. N. Barber, R. Lin, J. Hiscott. 2002. Transcriptional profiling of interferon regulatory factor 3 target genes: direct involvement in the regulation of interferon-stimulated genes. J. Virol. 76:5532. Fehr, T., G. Schoedon, B. Odermatt, T. Holtschke, M. Schneemann, M. F. Bachmann, T. W. Mak, I. Horak, R. M. Zinkernagel. 1997. Crucial role of interferon consensus sequence binding protein, but neither of interferon regulatory factor 1 nor of nitric oxide synthesis for protection against murine listeriosis. J. Exp. Med. 185:921. O’Connell, R. M., S. K. Saha, S. A. Vaidya, K. W. Bruhn, G. A. Miranda, B. Zarnegar, A. K. Perry, B. O. Nguyen, T. F. Lane, T. Taniguchi, et al 2004. Type I interferon production enhances susceptibility to Listeria monocytogenes infection. J. Exp. Med. 200:437. Haase, R., C. J. Kirschning, A. Sing, P. Schrottner, K. Fukase, S. Kusumoto, H. Wagner, J. Heesemann, K. Ruckdeschel. 2003. A dominant role of Toll-like receptor 4 in the signaling of apoptosis in bacteria-faced macrophages. J. Immunol. 171:4294. Hsu, L. C., J. M. Park, K. Zhang, J. L. Luo, S. Maeda, R. J. Kaufman, L. Eckmann, D. G. Guiney, M. Karin. 2004. The protein kinase PKR is required for macrophage apoptosis after activation of Toll-like receptor 4. Nature 428:341. Serbina, N. V., W. Kuziel, R. Flavell, S. Akira, B. Rollins, E. G. Pamer. 2003. Sequential MyD88-independent and -dependent activation of innate immune responses to intracellular bacterial infection. Immunity 19:891. Opitz, B., A. Puschel, B. Schmeck, A. C. Hocke, S. Rosseau, S. Hammerschmidt, R. R. Schumann, N. Suttorp, S. Hippenstiel. 2004. Nod proteins are innate immune receptors for internalized Streptococcus pneumoniae. J. Biol. Chem. 279:36426. Hata, N., M. Sato, A. Takaoka, M. Asagiri, N. Tanaka, T. Taniguchi. 2001. Constitutive IFN-α/β signal for efficient IFN-α/β gene induction by virus. Biochem. Biophys. Res. Commun. 285:518. Taniguchi, T., A. Takaoka. 2001. A weak signal for strong responses: interferon-α/β revisited. Nat. Rev. Mol. Cell Biol. 2:378. Shi, S., C. Nathan, D. Schnappinger, J. Drenkow, M. Fuortes, E. Block, A. Ding, T. R. Gingeras, G. Schoolnik, S. Akira, et al 2003. MyD88 primes macrophages for full-scale activation by interferon-γ yet mediates few responses to Mycobacterium tuberculosis. J. Exp. Med. 198:987.